Does your company follow a business meeting agenda format? Does your staff hate to attend? Do the meetings go on-and-on and seem to be disorganized most of the time? Are they unstructured and boring? This article discusses multiple forms necessary for the business meetings. You can download these forms by signing up for our free QA Solutions Ezine below. Every meeting presents an opportunity for the leader or meeting owner to connect with the employees / attendees whether a direct line, matrixed, or whatever structure... and convey a sense of mission. sometimes facility, airfare / travel, and meal costs. Therefore, your company should consider every business meeting as a significant event that must produce a return on investment. To conduct successful meetings you need to be focused, and you need to have a process. You need to follow a business meeting agenda format. If you've ever analyzed a good, productive meeting you'd know that it had very specific, clearly defined, and well-articulated goals. All meeting attendees clearly understood the theme of the meeting as well as the objectives. They all had a meeting agenda to use as a roadmap. By following this business meeting agenda format, you find that participants adhered to agenda items and time. Meeting participants had a structured opportunity to get involved. They had some opportunity to do some networking. They also had a chance to provide meeting feedback through a formal meeting measurement survey. Lastly, if you really want to pump-up employee morale, occasionally hold that meeting off-site. With this business meeting agenda format, a new work force evolves as employees strive to increase productivity and participation to help a company move forward. In order to help facilitate this, companies need to overhaul most repeating (meetings which take place on a regular recurring basis, i.e., weekly, bi-weekly, monthly, etc.) meetings. Most repeating meetings are too long, too boring, too unstructured, too one-sided, and too non-participative. The aim of most repeating meetings should be to set strategic direction, as well as address operational and tactical issues, share information, make decisions, get / give direction, and leverage resources for the good of the company, so that they can fulfill the Mission Statement of the company. The owner of this process would be the "Meeting Process Owner". The customers of this process would be the meeting attendees and their constituents. The meeting process owner would use this business meeting agenda format to consistently apply the information in order to conduct more productive meetings, where all attendees have an opportunity to actively participate, and where all meetings have an opportunity to be continuously improved. Improvements in meeting length, agenda timing, meeting structure, meeting participation, etc., enables employees to realize increased productivity, efficiency, and higher quality work through improved morale and motivation. Company's meetings aim to set strategic direction, as well as address operational and tactical issues, share information, make decisions, get/give direction, and leverage resources, which helps the company fulfill the mission statement. Note: Repeat the aim and ground rules for these meetings at the beginning of each meeting for the first (3) meetings and after any changing goals. Strategic direction means direction beyond the current operational year that selects planned methods or a series of maneuvers or stratagems for obtaining specific goals. Share information means to receive information and give information pertinent to a majority of the meeting attendees, or be of general importance/significance. 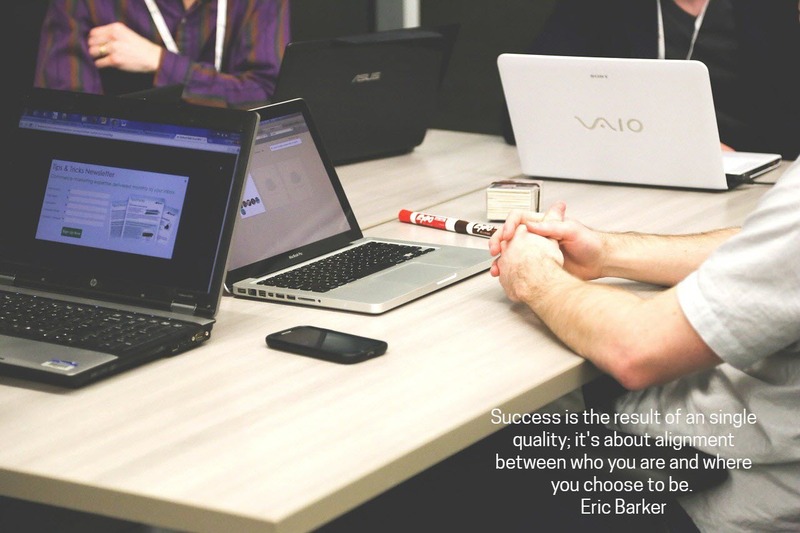 Decisions means the decisions that must be consistent to enable improvement across your company. Direction means guidance indicating the appropriate or preferred tendency or trend to be followed, which need not be construed as authoritatively mandated. Leverage resources means to either select champions or provide and apply cross-company resources to a common problem. This business meeting agenda format requires these ground rules. Respect the views of others. Roundtable items should be pertinent to a majority of the meeting attendees. Attendance will be given high priority. If, however, one cannot attend, the absent team member gives his/her proxy to a bonafide substitute and notifies the meeting facilitator. As much as possible attendees will use the same substitute each time they need one for continuity purposes. The team member updates and informs the substitute to the extent that the substitute can actively participate. The substitute updates the absentee on the topics missed. If the meeting facilitator cannot attend, or gets called out of the meeting, the meeting will go on as planned. Submit all potential agenda topics or initiative proposals on the "Agenda Topic Summary Form" (pictured below, plus you can download by signing up for the QA Solutions Ezine) via email to the meeting facilitator 5 business days before the scheduled meeting. Any topics submitted and not included on the next meeting agenda will be held for potential inclusion on subsequent meeting agendas. 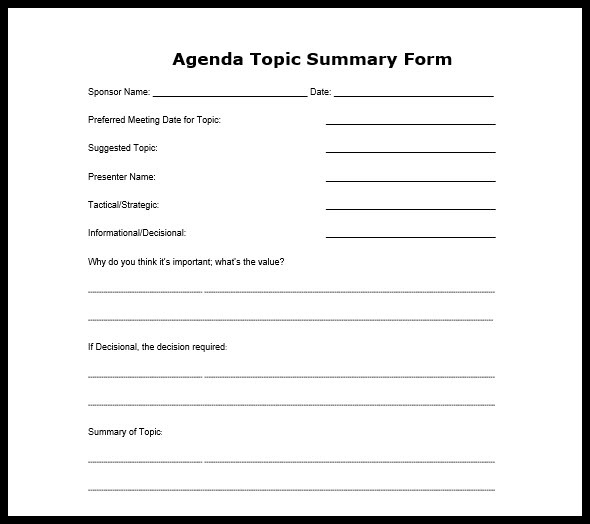 If someone adds a topic after publishing the final agenda, the new topic sponsor sends out the Agenda Topic Summary Form via email to all attendees. For your this business meeting agenda format use the following guidelines but change the timing to match you needs. General guidelines are 20 minutes for each information only item and 40 minutes for each decision item, maximum, to manage agenda timing and overall meeting time length. The topic sponsor tracks adherence to the agenda timing and if needed, gain attendee agreement to overrun. When a topic runs over planned agenda time, the meeting facilitator adjusts the remaining agenda. Each attendee presents pertinent information, or "pass" during the roundtable segment of each meeting. Allocate each presenter up to 10 minutes. To assist time management, the meeting facilitator notifies each presenter when time is up. If time runs out, the presenter gains attendee agreement to overrun. If agreement is not attained, the presenter chooses which remaining topics to bring to a future meeting. Each roundtable presenter who wishes their topics to be included in the meeting minutes submits via email to the meeting facilitator, within 1 business day, their information written in a manner suitable for inclusion in the minutes, as is. After the conclusion of some presentations, allocate 5-minutes for a short discussion to summarize the value received from the presentation, to help facilitate future agenda topic selection. 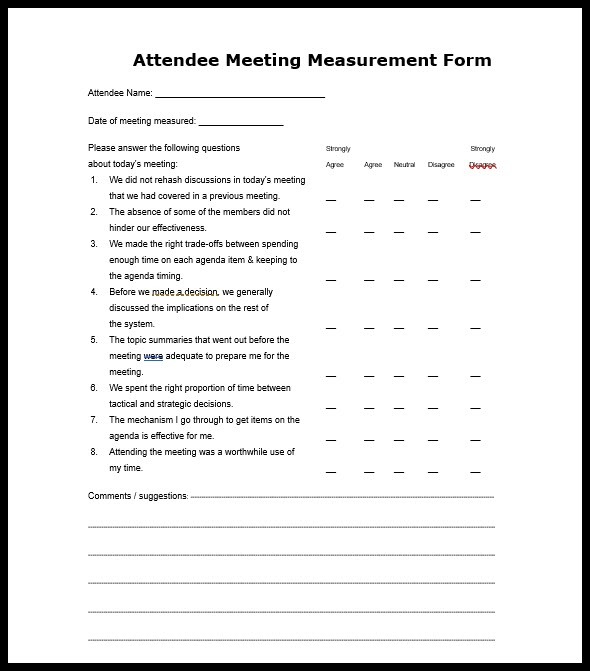 After each meeting, attendees measures the effectiveness of the meeting from their perspective utilizing the "Attendee Meeting Measurement Form" (pictured below, plus, you can download by signing up for the QA Solutions Ezine). Once every quarter the facilitator of the meeting reviews these measurements, and incorporate appropriate quality improvements to the overall meeting process. In addition, the facilitator measures the effectiveness of the meeting from his/her perspective utilizing the "Facilitator Meeting Measurement Form" (pictured below, plus, you can download by signing up for the QA Solutions Ezine) to provide additional insight to consider while incorporating quality improvements into the overall meeting process. We recommend using Streamliner for business meeting agenda format recording actions and decisions. c) an action item with the appropriate owner noted. The decisions that belong at this meeting require consistency to enable improvement across your company. Make decisions by consensus (everyone agrees they can abide by the decision). No silent disagreement. If you need to postpone a required decision, assign a owner assuring that they bring up decision again as needed.